Bring! 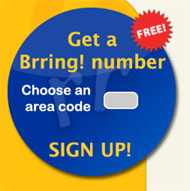 is a new service that gives you a personal phone number to give out which forwards to your real phone number. The difference between Bring! and a normal call forwarding service is that you make money whenever some calls your Bring! number. Brring! places an ad on your line which is played when someone calls you. Each ad is about 10 seconds long. According to the Brring! FAQ, you’ll typically receive around $0.05 per ad played but some ads can earn up to $1. Right now they have a special on where you receive $1 for the first 10 calls you receive! Brring! offers many useful features you can use to customize your account. For example, you can choose which area code you’d prefer to have for your new number. Currently the area codes offered are for American cities. They do take requests for other area codes if you want to have the same one as your local number. Just for fun, I chose to have a 212 area code on my line (New York). You can also customize the ring tone your callers will hear after the ad is played while calling you. You can upload your own custom MP3 with your choice of music, or maybe even a simple message saying, “Please wait while your call is connecting to me…” in your own personal voice. They also offer an affiliate program which pays $1 per sign up. You could sell this idea to a group of friends offline and have all of them sign up under you, then you could all call each other at make money together. Would you use it, Chris? I am using it! It’s a great giveaway number to have on your business card or give to anyone who you don’t want to have your real number. If you’d like to try out the service, you can call (718) 337-8746 and hear an example of the type of ads that your callers will here. Just wondering if anyone has used this (including the author of this article) and, if so, have you received a check from them. I requested a check once I hit the $10 mark and it said you would receive an email when your payment is ready. That was a couple weeks ago and I have yet to receive an email or check in the mail. Just want to make sure they actually pay out on this or if it’s some sort of scam. Steve: I received a cheque from them for about $25 a few weeks ago. You should e-mail them and follow up on your payment. Good luck. Thanks for the reply Chris. I was wondering about something else too. When you sign up for a Brring number and get it in your area code and someone else in your area code calls it, is it considered a local call or long distance? Just wondered with this being an Internet thing. Thanks. Thanks for the response Chris. I just tried calling my Brring number from a regular phone (that doesn’t have a long distance plan) in the same area code, and I was required to dial 1+area code+local number for it to go through. This would seem to confirm that even though you are dialing what should be a local number, it is considered long distance. So those that call my Brring number are actually being charged for calling it (long distance), even though it should be a free local call!! Can you confirm this or am I wrong somehow?? That’s weird… I guess it depends how far you are from where the number is actually based. I know where I live that even though I’m in the same area code as someone, if they’re more than 200 miles from me I have to dial 1+area code+number. As I said earlier, I’m using a New York area code, so because I’m not actually in NY I can’t test it to see if a local call would work or not. Chris, how long did it take you to get your check from them after you cashed out? I’m at the 45 day mark and haven’t heard a thing. I emailed them and haven’t had a reply. I have about 30 referrals and I’d hate it if I had led them into a scam. Debbie: It took about two weeks to get a cheque after I cashed out. However, I’ve stopped monitoring how much I’m making and have put the monetization of the whole thing on the back burner. I just find is useful to have another number people can reach me at. Any cash that this brings in is just an added bonus. I’m glad to know that someone actually got paid. I am very disappointed that it is taking so long for mine. I did nothing to violate TOS, as all I did was an article of them that brought me referrals and gave my number to a few people, no excessive calling or “call rings” as I have seen going on in some forums. I’ll try to let you know when I do get my check. Thanks for responding. I also signed up for Brring about 3 weeks ago. I hit the $10 mark in about a week. I requested a payout and it has been about 2 weeks and I haven’t heard a thing! I have tried to contact them many times and have got no responses. Needless to say their customer service is very poor. …so I’ve been hearing. That’s too bad. I requested a payout the first few weeks after they launched and got it. Maybe they’ve just become lazy since then, or perhaps it’s the sign of another .com going belly up. I have signed up for this site about a hour ago but when i call my nimber i get “Were sorry you call could not be compleated as dialed” I wish i could use this service soon. Harrison: Is the number you’re forwarding the call to correct? Yes, but I just went to the forum and they said that they are “catching up on some calls” and it will be cleared up today. The link in connected to my name. Ps: that was a nice speedy reply. Regarding being able to call the new Brring number from your area code, are you calling it from a landline or a cellphone? If you are calling it from a landline and it is in the same area code, but not considered as a local prefix, then you would have to dial a 1 + area code. If you are calling it from a cell phone and you are in the same area code, you won’t have to dial the area code as most, if not all, cell phones don’t have long distance charges, especially if it’s in the same area code. I live in a state where the entire state has one area code, so I can call 400 miles away on my cell phone and dial it as a local number, though if I dial it from my landline, I have to put a 1 + area code to process the call. I just tried to sign-up from a referral that someone else sent me and he was able to get a number in my area code, but when I try it, they say there is not one available. They must be limited on numbers right now. If this is all it’s cracked up to be, this will be a great tool for making a few bucks! Thanks for your comment, Shelli. I’ve been hearing a lot of this sort of thing lately. Although I’ve never experienced a problem with Brring personally, I’m going to definitely look into this more closely. Hey Chris I just got the service and what i get from all this is that it may take time before it runs at 100% because think about it, there are tons of people who use Brring! for the same reason…To GET PAID or TO GET EXTRA MONEY, and everyone wants there check quick and it probably just overloaded their servers or something but i guarantee everyone will probably get paid but i was searching for peoples blogs and i found someone that got her check and it is a real person and not a SCAM CONSPIRACY from Brring! They finally answered my email and apologized for the delay in payments saying they were overwhelmed with the response to their beta. And my first check should arrive the middle of next week. So, we’ll see. At least they answered me. I did get y check from Brring in Jan. for $120.30! I finally got my little check Saturday!! YooHoo! I do feel better, but they still owe me about $50. Anyway, as long as the check don’t bounce, lol, I’ll get back to promoting them. If I can figure out how to use my little camera, I’ll take a pic and post it. Great day to all! Requested payment in Nov. No payment received to date. Starting to think they are a scam. Friend also requested payment in early Dec. and she hasn’t received anything either. I have sent 2 emails. They responded to the 1st one saying they needed more time, but ignored the 2nd one. Four months is long time to wait for payment. I posted here the first time back in late Jan and hadn’t received payment. I AM STILL WAITING!!! They also told me that they ‘needed more time’…how much bloody time do they need. At this point I would not recommend and would be apt to call this a scam! brring will not allow me to log in it says error on page. wt heck is going on? is there a place i can contact them? i can’t log in either and i thought it was just me. does anyone else have a problem logging in? something is up.